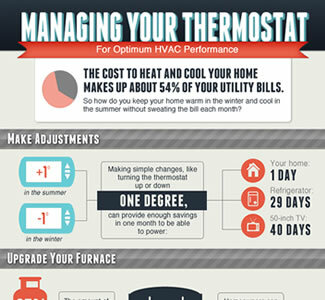 According to the U.S. Department of Energy, heating and cooling accounts for almost half of home energy use. Since climate control can be a huge slice of your budget, it's the best place to begin when looking for ways to save energy. Where to begin? It starts with your thermostat, but there are several ways to stretch your HVAC dollar without sacrificing comfort. Adjust your thermostat. A good rule of thumb is to set your thermostat to 68 degrees in winter and 78 degrees in summer during waking hours. You can save even more by dialing the heat or air conditioning back a few extra degrees overnight or when your home is unoccupied. The Department of Energy estimates you can save up to 10 percent per year on your energy bills simply by adjusting the thermostat by 10 to 15 degrees for 8 hours a day. Consider a programmable thermostat. Remembering to adjust your thermostat daily can be a challenge. A programmable or smart thermostat lets you set your schedule and forget about it! The latest smart thermostats are easy to program, can make intuitive adjustments for you and can be controlled from anywhere with a smartphone. Check your décor. No matter how nice your home looks, it's bad design if furniture or curtains are blocking your vents. You should also let your window treatments help you save energy -- keep them open during cold weather days to benefit from the warmth of the sun, but close them on hot summer days to avoid overtaxing your AC. Keep it clean. Just like your car, your heating and air conditioning systems need regular maintenance to keep them working efficiently. Change filters every three months or as recommended by the manufacturer, and call a qualified technician for an annual tune-up. Professionally maintained systems are less likely to break down and more likely to live beyond the average life expectancy. Consult the experts. Not technology savvy? Confused by your programmable thermostat? If you moved into a home with a thermostat you don't know how to operate, or you're not sure it's accurate, contact the manufacturer or an energy efficiency expert for help. Safeguard the comfort of your home with a heating and cooling protection plan. Browse our available heating and cooling protection plans, or call us at 1-888-733-1683 for more information.